Guitariste Bluegrass US né Lester Raymond Flatt, le 19 Juin 1914 à Overton County (Tennessee). Lester Flatt, à la fin des années trente, fasciné par les premiers enregistrements des Monroe Brothers, étudie ce style et apprend à jouer de la mandoline. Il fait ses débuts en 1939 sur la radio WDBJ de Roanoke (Virginie) et en 1945 il est engagé dans les Bluegrass Boys de Bill Monroe. 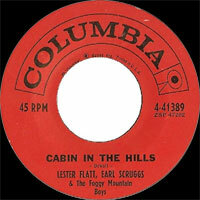 En 1948, il s'associe avec le banjoïste Earl Scruggs pour former "Flatt & Scruggs & The Foggy Mountain Boys". Ils enregistrent alors chez Mercury, Columbia Records et sont devenus des légendes du Bluegrass. Lester Flatt est mort le 11 Mai 1979 à Nashville (Tennessee). Flatt was born June 19, 1914 in Duncan's Chapel, Overton County, Tennessee, to Nannie Mae Haney and Isaac Columbus Flatt. A singer and guitarist, he first came to prominence as a member of Bill Monroe's Blue Grass Boys in 1945. In 1948 he started a band with fellow Monroe alumnus Earl Scruggs, and for the next twenty years Flatt and Scruggs and the Foggy Mountain Boys were one of the most successful bands in bluegrass. When they parted ways in 1969, Flatt formed a new group, the Nashville Grass, hiring most of the Foggy Mountain Boys. His role as lead singer and rhythm guitar player in each of these seminal ensembles helped define the sound of traditional bluegrass music. He created a role in the Bluegrass Boys later filled by the likes of Jimmy Martin, Mac Wiseman, Peter Rowan and Del McCoury. His rich lead voice is unmistakable in hundreds of bluegrass standards. He is also remembered for his library of compositions. The Flatt songbook looms titanic for any student of American acoustic music. He continued to record and perform with that group until his death in 1979 of heart failure, after a prolonged period of ill health. Flatt was posthumously inducted into the Country Music Hall of Fame in 1985 with Scruggs. He was posthumously made an inaugural inductee into the International Bluegrass Music Hall of Honor in 1991. 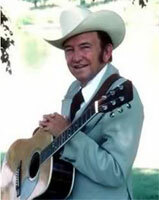 His hometown of Sparta, Tennessee, held a bluegrass festival in his honor for a number of years, before being discontinued a few years prior to the death of the traditional host, resident Everette Paul England; Lester Flatt Memorial Bluegrass Day is part of the annual Liberty Square Celebration held in Sparta. Flatt and Scruggs were ranked No. 24 on CMT's 40 Greatest Men of Country Music in 2003. They performed "The Ballad of Jed Clampett", which was used as the theme for the television show The Beverly Hillbillies. Probably the most famous bluegrass band of all time was Flatt & Scruggs and the Foggy Mountain Boys. They made the genre famous in ways that not even Bill Monroe, who pretty much invented the sound, ever could. Because of a guitar player and Vocalsist from Tennessee named Lester Flatt and an extraordinary banjo player from North Carolina named Earl Scruggs, bluegrass music has become popular the world over and has entered the mainstream in the world of music. Like so many other bluegrass legends, Flatt & Scruggs were graduates of Bill Monroe's Blue Grass Boys. 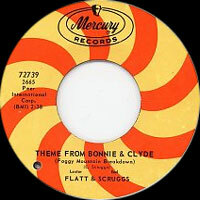 Because of the unique sound they added ("overdrive," one critic called it), Monroe felt let down after Flatt's quality Vocalss and Scruggs's banjo leads left in 1948. Quickly the two assembled a band that in the opinion of many was among the best ever, with Chubby Wise on fiddle and Jody Rainwater on bass; a later band, with Paul Warren on fiddle and Josh Graves on dobro, was equally superb. With so many extraordinary musicians and the solid, controlled Vocalss of Flatt, it's no wonder the Foggy Mountain Boys were the band that brought bluegrass to international prominence. 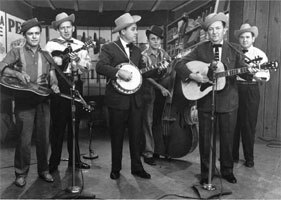 From 1948 until 1969, when Flatt & Scruggs split up to pursue different musical directions, they were the bluegrass band, due to their Martha White Flour segment at the Opry and, especially, their tremendous exposure from TV and movies. 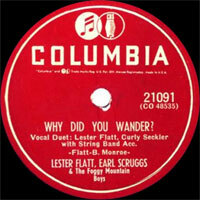 Flatt and Scruggs were originally brought together by Monroe in 1945, when they joined a band that also featured fiddler Chubby Wise and bassist Cedric Rainwater. This quintet created the sound of bluegrass and helped bring it to national recognition through radio shows, records, and concerts. After three years with Monroe, Flatt left the mandolinist behind in 1948, and Scruggs followed his lead shortly afterward. The duo formed their own band, the Foggy Mountain Boys. Within a few months, they recruited ex-Blue Grass Boy Rainwater, fiddler Jim Shumate and guitarist/Vocalsist Mac Wiseman. Initially, the band played on radio stations across the South, landing a record contract with Mercury Records in late 1948. Over the next two years, they toured the U.S. constantly, played many radio shows, and recorded several sessions for Mercury. One of the sessions produced the original version of "Foggy Mountain Breakdown," which would become a bluegrass standard. 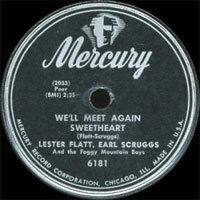 In 1951, Flatt & Scruggs switched record labels, signing with Columbia Records. By this point, the band now featured mandolinst/Vocalsist Curly Seckler, fiddler Paul Warren, and bassist Jake Tullock. Where the careers of other bluegrass and hard country acts stalled in the early and mid-'50s, the Foggy Mountain Boys flourished. One of their first singles for Columbia, "'Tis Sweet to Be Remembered," reached the Top Ten in 1952, and in 1953, the Martha White Flour company sponsored a regular radio show for the group on WSM in Nashville. In 1955, the band joined the Grand Ole Opry. The following year, they added a dobro player called Buck Graves to the lineup. Flatt & Scruggs reached a new audience in the late '50s, when the folk music revival sparked the interest of a younger generation of listeners. The duo played a number of festivals targeted at the new breed of bluegrass and folk fans. At the same time, country music television programs went into syndication, and the duo became regulars on these shows. 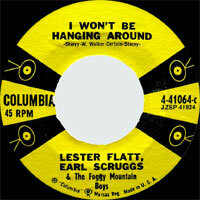 In the summer of 1959, Flatt & Scruggs began a streak of Top 40 country singles that ran into 1968 -- their chart performance was directly tied to their increased exposure. The duo's popularity peaked in 1962, when they recorded the theme song to the television sitcom The Beverly Hillbilles. 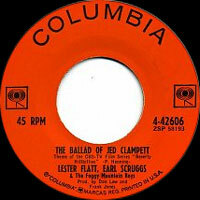 The theme, called "The Ballad of Jed Clampett," became the first number one bluegrass single in early 1963, and the duo made a number of cameos on the show. The Beverly Hillbilles began a streak of cameo appearances and soundtrack work for Flatt & Scruggs in television and film, most notably with the appearance of "Foggy Mountain Breakdown" in Arthur Penn's 1968 film Bonnie and Clyde. 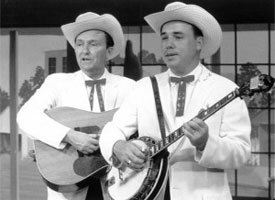 With all of their TV, film, and festival appearances, Flatt & Scruggs popularlized bluegrass music more than any artist, even Monroe. Ironically, that popularity helped drive the duo apart. 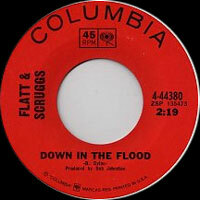 Scruggs wanted to expand their sound and pushed Flatt to cover Bob Dylan's "Like a Rolling Stone" in 1968 as well as land concert appearances in venues that normally booked rock & roll acts. Flatt wanted to continue in a traditional bluegrass vein. Inevitably, the opposing forces came to a head in 1969, and the duo parted ways. Appropriately, Flatt formed a traditional bluegrass band, the Nashville Grass, while Scruggs assembled a more progressive outfit, the Earl Scruggs Revue. 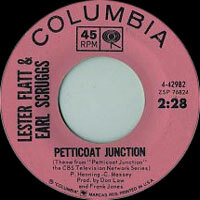 Throughout the '70s, both Flatt and Scruggs enjoyed successful solo careers. In 1979, the duo began ironing out the details of a proposed reunion album, but they were scrapped upon Flatt's death on May 11, 1979. Scruggs made many albums after his parting with Flatt, highlighted by 1982's The Storyteller and the Banjo Man (with Tom T. Hall) and 2001's Earl Scruggs and Friends (which featured an all-star cast including Johnny Cash, Elton John, Sting, Vince Gill, Albert Lee, Leon Russell, and Steve Martin). Scruggs was often seen on TV as well, often for reunion appearances. He died in Nashville in 2012. In 1985, Flatt & Scruggs were inducted into the Country Music Hall of Fame. 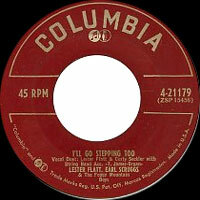 1958 EP COLUMBIA B 2823 (US) Lester FLATT & Earl SCRUGGS - Jimmy Brown The Newsboy / I'll Go Stepping Too / Randy Lynn Rag / ? 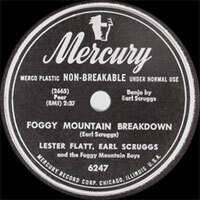 1961 EP MERCURY EP1-4034 (US) Lester FLATT, Earl SCRUGGS & The Foggy Mountain Boys - I'll Never Shed Another Tear / Foggy Mountain Breakdown / Pain In My Heart / ?